Once termed as the “Retirement Paradise”, Bangalore or Bengaluru is now a glittering IT city with upscale office spaces, swanky malls and bustling supermarkets and not to forget, the never ending traffic jams. However, in spite of this, Bangalore has retained some of its earlier days charm with its old book shops, coffee shops and streets where kids can be seen playing without any traffic or chaos. A perfect Bangalore itinerary for you would be a visit to places like Cubbon Park, Lal Bagh, VidhanSoudha, National Gallery of Modern Art, Visvesvaraya Museum, Karnataka ChitrakalaParishath and Wonderla Amusement Park among others. A trip to this city is said to be incomplete without visiting its beautiful temples including the Bull Temple in Basavanagudi, DoddaGanesha Temple and the ISKCON Hare Krishna Temple, which attracts thousands of devotees all year round. Cubbon Park is a green patch that covers about 300 acres and is a must visit for nature lovers. Cassia, gulmohar and oak stand over pathways and grassy patches and there are some secluded corners where you can relax and contemplate the scenic beauty around you. It also houses public buildings like the State Archaeological Museum, SeshadriIyer Memorial Hall and the Press Club. Touted as one of the biggest water parks in the country, Wonderla has water slides, on-ground rides and laser shows in the evening. The amusement park is situated on the Mysore-Bangalore highway. Visvesvaraya Museum would be an interesting choice for those who like science as it has aircrafts, turbines, a steam locomotive and a mechanical calculator on display. 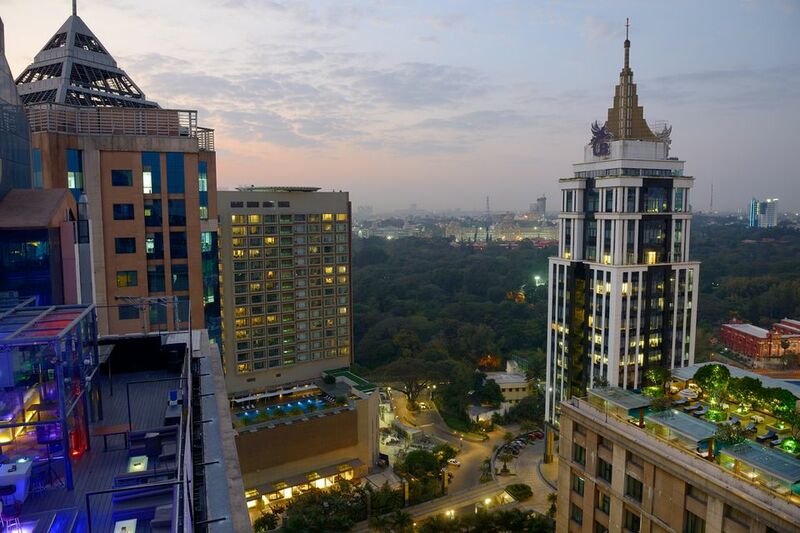 Bangalore is a also a delight for shoppers with its heady mix of shopping options. Commercial Street, Brigade Road, UB City and MG Road are some of the famous shopping markets where you can shop for designer clothes, jewellery, bags, souvenirs and the signature Bangalore silk sarees. If all this sightseeing and shopping will leave you famished, we suggest you to head to any of these restaurants to satiate your hunger pangs. You can take your pick from places like Koshy’s (St. Mark Road), Pecos Pub, Windsor Pub (Coorgispecialities), the Darshinis (for authentic South Indian food) and also the variety of street side stalls which serve amazing food. Bangalore is well-connected via road, rail and air from almost all major cities in India. If you are keen on a rail journey and planning to take Delhi to Bangalore trainson your next trip, there are umpteen options to choose from. Some of the famous ones on this route are Kongu Express, Bangalore Rajdhani, Karnataka Express, KtkSmprkKranti Express and Ypr S Kranti Express among others. And if you thinking about how to know where is my train then it can be tracked online via ixigoapp.The Delhi to Bangalore trains fare vary according to the trains. Some of these trains run on a daily basis while some operate weekly. To know more about where is my train from Delhi to Bangalore timings and other related information, check out the super cool ixigo app as it provides all necessary information at one go.